Toyohara Kunichika (1835-1900) Mirror of Pictures of Modern Actors: Portrait of the Actor Iwai Hanshiro as an Onnagata, 1881. Oban. We have a beautiful pair of actor portraits in the exhibition which I am hitherto unfamiliar with. Bearing a similarity with the two Toyokuni I prints above, the prints show actor portraits in role, reflected in a decorative mirror. This framing device is clever, allowing the artist to position the actor in a frame within a frame. The composition suggests another genre; that of the backstage dressing room and evokes the actor preparing to take to the stage, checking his reflection… his makeup and so on. The design suggests an intimacy that would not have been lost on the avid kabuki audiences. Iwai Hanshiro - almost certainly the VIII held the kabuki name from 1872 - 1882 - appears in a photograph in this or similar onnagata role from this period. 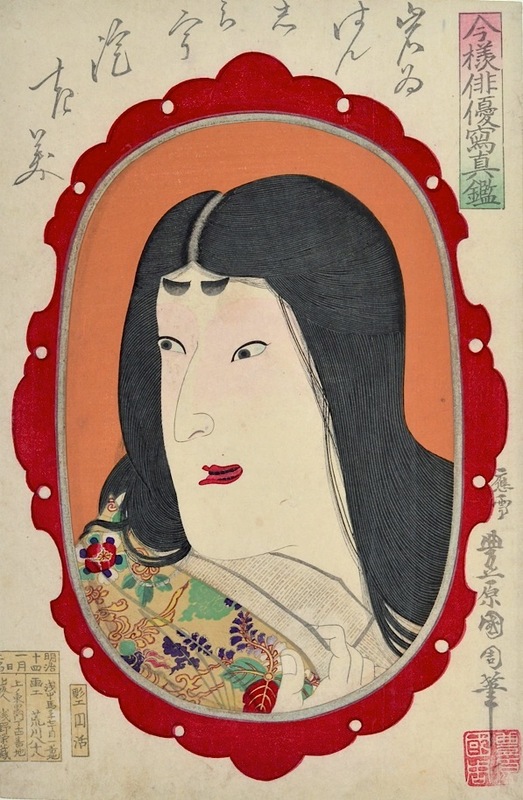 Kunichika here uses the realism first properly mooted by Kunisada in the above okubi-e series which stressed the male qualities of the performer above the female qualities of the role. The colour on the print is outstanding… the red of the frame, the orange of the background, the pattern of the robe, the colours all of them ‘knocked back’ have a beautiful and nicely judged harmony. The print is in very good condition and is a fine impression with embossing to the collar and burnished lacquer to the mirror’s edge.